Getting a small business VoIP PBX for your growing company is a smart move. Traditional small business telephone systems are expensive and require installing and maintaining complex equipment on location. However, small business VoIP PBX services are cloud-based. They are hosted off site so there is no closet full of phone equipment to hassle with. The only telecommunication equipment your office will need is an internet connection and some IP-phones. Another great thing about small office voice over IP PBX systems is scalability. As your business grows, so can your phone system. Adding additional lines, phones, or users is incredibly fast and easy with small business VoIP PBX systems. You can literally add an additional telephone line or get a toll free number in seconds. And if your company opens another office you can connect the all offices with one business telephone system using a virtual PBX service such as business VoIP. 1. 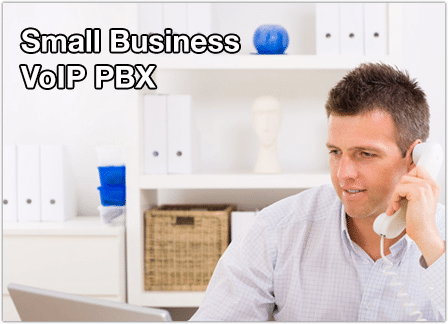 Small business VoIP PBX services are affordable and easy to implement. 2. (Voice over Internet Protocol) and hosted PBX telephone systems require no equipment other than IP-phones. 3. VoIP PBX systems for small businesses are scalable and can expand as the business grows.